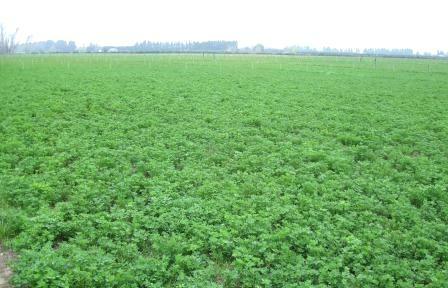 In preparation for spring the lucerne had a clean-up graze on 14/6/2012 and on 23/7/2012 Gallant Ultra (520 g/litre haloxyfop-P) was applied at 0.5 L/ha to control twitch. Broadleaf weeds were controlled by spraying with Gramoxone (2 L/ha) and Atrazine (1 kg/ha) on 27/7/2012. Our target is to start grazing when the lucerne reaches 15-20 cm high. The photo below shows the stands were about 13-14 cm high on 28 Aug. The photo below was taken on 3 Sept 2012 looking across the grazing experiment. 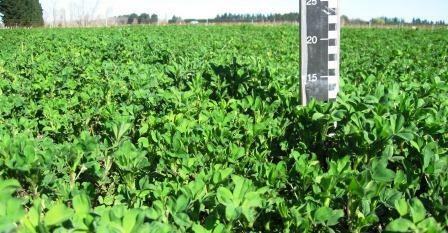 Lucerne is looking healthy, with a good colour and is growing well. At this stage our target is to start grazing on 5 Sept at 14 ewes/ha with twin lambs at foot.